There is little doubt when Artlantica formation was announced power and progressive metal fans should have taken note. Just read the names of contributors on this superproject. Roger Staffelbach on guitars (Artension), John Macaluso on drums (Ark, Malmsteen) and John West (Artension, Royal Hunt), with Chris Caffery (Savatage) and Steve DiGiorgio (too many bands to list here) also donating their talents. Such collections of stars can go either way, but on Across the Seven Seas Artlantica does well enough to maintain the interest not embarrassing the aforementioned stars in the process. The album does not open many new horizons but maintains a steady course in its navigation of waters situated somewhere between US-tinged power metal, some symphonic touches (mainly due to keyboard presence) and overall progressive feel periodically pushed into the forefront by excellent overall musicianship and highlight guitar leads. The songs on Across the Seven Seas come with alternating accents and avoid stagnation. Harsh riffs on the lyrically prophetic opener 2012 and the obvious chorus hook put the song somewhere between Helstar and Iced Earth, while the steady rolling double bass and much more prominent keyboards of Devout bring it closer to the European school of late Malmsteen works, Kenziner or Royal Hunt (with John West’s voice possibly causing déjà vu flashbacks). There is some sense of symphony and drama in songs like blistering Devout and Heresy, perhaps due to more keyboard presence, while the title track is heavier, more deliberate in tempo with the nowadays fashionable mid-Eastern touches. All elements come together the best on the closer Nightmare Life, so you will have to be patient. The song is prominent with its most non-linear songwriting. Here is the faster driven opening part propelled by the strong main riff, fluid leads equaling to “wailing silence” in John West’s head, closed out by his smooth balladeering next to classic piano. Although a veteran of the scene, John West can still take a high note (Devout, Demon in My Mind). Roger Staffelbach does not overdo it in the “let’s go places” guitar department, but his fluid arpeggiated leads provide the necessary punch and excellent melodic emphasis in the title track or Nightmare Life. The band rips it loose on the instrumental Return of the Pharaoh Pt. III letting the skills shine and totally take over, with the bass going overtly nuts. The middle of Across the Seven Seas experiences a little bit of a swoon, with solid but not spectacular You’re Still Away, attempting a bit of a darker edge, and risqué ballad Ode to My Angel, showcasing nothing but John West’s vocals and piano. Artlantica then finds their way back to being energetic with a cool headbanging riff on Fight for the Light with its hooky chorus, and the momentary weakness is soon forgotten. Across the Seven Seas is not full of those moments, but at the same there aren’t many 10 out of 10, home run songs registered here either. When I put this album on, I do enjoy hearing it. Then I set it away and only feel the urge to revisit it because my review needs a refresher spin-through. It would be interesting to see if Artlantica produces only a one-off album, or the project has a continuation. 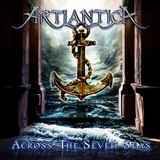 Either way if you collect albums from the original bands of the Artlantica players, like Artension and Royal Hunt, then Across the Seven Seas is something logical for you to seek.